Handicap transportation can be improved several notches if a handicap vehicle can be utilized. It is one thing to own a handicap scooter, but that is only half of the picture. Being able to get that scooter from point A to point B is the fulfillment of a dream for a disabled individual who was formerly limited in their options. This is where handicap mini vans must be available to transport these heavy vehicles. When considering used handicap mini vans be sure to find out if this is the best option for you. There could be alternatives with better prices. There are a number of variations and different applications for handicap vehicles. In an effort to reduce costs, many convert used mini vans into usable handicap vehicles that can be used to suit a number of conditions. Some van conversions are designed to allow a person to drive up a retractable ramp and then move their wheelchair into position behind the steering wheel. Another popular option that provides excellent handicap transportation is a drive on lift arrangement that actually lifts the scooter and safely places it in the back of the mini-van. They are operated by a hand held device that raises and lowers the scooter, thereby affording the user a great deal of flexibility. There are other applications, but all of them solve the problem of mobility. Handicapped individuals can now be easily included in family adventures and trips, and made to feel more like an active participant in daily life. It’s a wonderful way to provide a meaningful extension of capabilities. New handicap equipped vehicles and van conversions can be quite costly, even though the automotive companies provide some price relief. Ideally, if you can locate a mini van that has already been converted, that would be the best plan of action. Previously converted vans can be purchased at a slight premium over a comparable van that has not been converted. The cost of converting can vary accordingly. Here is one example of cost for adding a scooter lift to the rear section of a 2010 Chrysler mini-van. The price of a new mini-van was quoted at $28,000. A used van with similar equipment was purchased for just under $17,000. The automatic heavy duty lift was installed for $3500 for a total of $20,500. The new van was priced at $31,500 with the lift. Overall, buying a used van conversion instead of a new vehicle resulted in savings of $11,000. Renting a service that transports your scooter or wheelchair is also an affordable possibility over purchasing. Handicap equipment for cars is a necessary need for those people who have disabilities. Having a car that is equipped for a handicapped individual allows that person freedom to travel, visit family or friends, go to medical appointments, etc. A vehicle that is equipped with these aids lets the person get into and get out of the vehicle much easier and safer. Having the right equipment makes the transition of leaving your house and getting into the car easier for the person. Let us quickly explore the options. Some affordable handicap devices and simple vehicle aids would include a car grab bar. The grab bars are easily inserted and mounted to a solid area, such as a car door U hook or car window or anywhere you need assistance or support. They are easy to grip and small enough to be portable. Click here for more information and pictures. Another great affordable item would be a seat cushion that swivels. 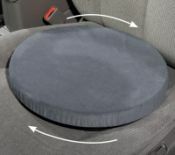 Simply place on your car seat and just swivel the cushion with the movement of your body and it turns to help you get in and out of the car without having to twist and turn your body. There is also a trapeze like item that you attach to your car’s door and window frame that you pull the handles that assist you out of the car. The cost of handicap car aids would range in price. The most expensive is purchasing yourself a handicapped equipped vehicle. To save money, you can also have your car, van, or truck converted into a handicapped vehicle. The cost of this will vary depending on what you plan on having done and the extent of work, but it could run you into thousands of dollars. You will want to see what works best for you because in the end it could save you a lot of money. Generally, insurance does not pay for this, but double check with your provider to make sure. Having a car aid allows someone who does not want to lose their mobility freedom and have to depend on someone else. In certain situations, by using these handicap aids for your car, you can still enjoy getting out and enjoying your life.